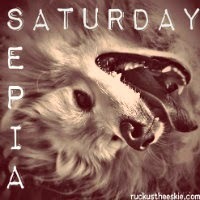 Ruckus the Eskie: Sepia Saturday #69: Go, Pro, Dog on the Go! Remember this week's Thoughtless Thursday? Here's Ruckus field-testing the GoPro in Santa Barbara, CA. doggie on a mission. Have a wonderful weekend. Have fun Ruckus. Have a super Saturday. Looking awesome in your GoPro Ruckus!! Can you swim with that camera? Does it inhibit your motion? Ruckus the Photographer! Wow, how cool! Bet your having a blast out on the water Ruckus!